Usually about this time every year I get the sample run of my flies that are to come out the coming year. I have been a comercial tier for Idylwilde fly co. now for a number of years and am always humbled to think people actually pay money to buy my flies at fly shops around the country. If you talk to other tiers that work with other companies when they get their samples they began a laundry list of issues with the flies... materials are not the right color, this is to long or to short, this is to bulky, this isn't tied in right, etc. I have about 30 some patterns out now and I can't remember a time my sample didn't come looking perfect but actually better than I tied them....kinda sad when someone ties your own patterns better than you do. *Mind you I am not a photographer and these were really quick snap shots. Went on the Sac for some dinner and striper fishing with steph and Ollie. Wind was blowing pretty good so as soon as I put the boat I knew fishing was most likely out based on the white caps. Rode down to camp and had some dinner then swam for a bit then headed out to throw some poppers but with the wind blowing the boat all over the place and the spray from the poppers going horizontal we gave up on fishing really quick. Gonna see what the wind does today. Two good buddies of mine who are editors of a fly fishing magazine came into to town Friday night. 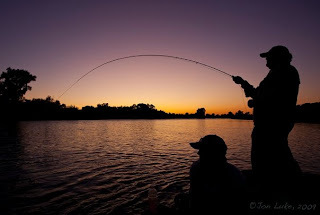 This was a long planned trip to come and fish with me around chico, ca - take some photos and hammer out some articles. Saturday we fished a local lake for bass and carp and even with wind and off color water we caught a few nice bass and got some great photos. As the wind laid down the carp also moved into the flats and we found some nice tailers close to the banks. After lunch at Scotty's we headed to the Sac and some stiper fishing. First spot we hooked a few nice 2-3lb scrappers and a nice 8lber. Later in the day we moved into the sloughs to chase some large mouth. found some nice fish but they were not very willing to jump on our flies. 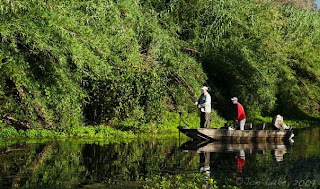 The next day we headed back out to the river and chased small mouth and large mouth up some creek channels and sloughs. Caught plenty of fish but nothing that big. Seems to be that most of the large bass are seeking cooler water in the main river channel or are barring them selves in the weeds. 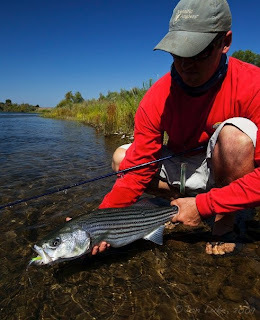 During the late afternoon we started chasing stripers in the main river. 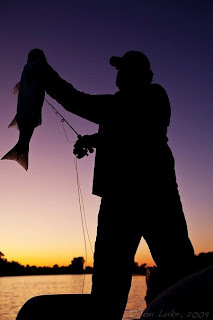 We found a bunch of nice 2-4lb fish in deeper water and then as the sun went down moved to some top water spots. Top water fishing turned on about 745pm. We boated about 10 fish up to 8lbs on poppers and most passes multiple fish busted on our flies. Great top water fishing is hard to beat. 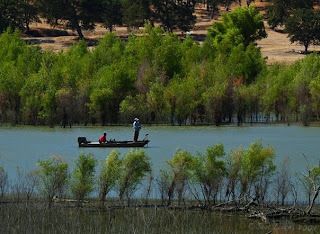 Next night we head over to the Oroville After Bay to chase some spoted bass. We found good numbers of fish up against the reeds once the sun went down willing to come up for any popper we put up tight to cover. Not the biggest fish but spots always fight bigger than they look. Overall a great few days of fishing with some really fun guys and great fisherman. Gonna get back out again this weekend on the Sac for some top water stripers. Went out striper fishing with my buddy Jay and the Sheek on Saturday. Fishing was good suprisingly. We caught or hooked fish at every spot we fished. The river in certain areas was crowded with bait and plug fisherman but if you know the river you can get away from people. I am really looking forward to the next month and half of striper fishing. Back out there probably tomorrow after work (first day back to school - all meetings though) and then again thurs/fri. Got home from South Carolina late sunday night and took monday and tuesday to put my life back in order after being gone two weeks. Paid some bills, answered emails, put a massive todo list for the next week together and was sucseful in putting off cuting my jungle of a yard. The trip was great .... fishing, golf, family, and the southern coast. I have visited this area a few times and the south is a great place, Savanah GA, Charleston SC, and HIlton Head are great towns and areas. Regards to CA fishing, I was on the Lower Sac yesterday from Barge to Bend and the fishing was good. Put about 20 in the boat and lost another 10-15. All the fish were a fat 15-16 inches for the most part with a few under and a few over that we lost. Today gonna do some work to get ready for school to start and then head out for striper fishing. The Stalk...swirl is the tailing fish....the grab (not subtle take with redfish)...the run....the fish....repeat this 10 - 20 times in 2-3 hours is a ton of fun.